For the past few months I have been working with my associates on implementing a new Microsoft application that just came out of beta at the end of May. It’s called Microsoft Tag a new type of barcode system you can download onto your mobile phone (at no cost). Now this sounds as exciting as watching paint dry but I guarantee you this little application will have a significant effect on mobile marketing and the ability to interact with other media. Let me go into some detail and see if you agree with me. Microsoft Tag is a new technology that helps change the way consumers’ mobile devices can be used. Tag adds interactivity to marketing materials which allows sellers to connect more effectively with buyers in a measurable way. Tags are as tiny as 5/8″ can be included on all kinds of material such as print publications the Web, e-mail, street signage, store windows, maps, social applications, you name it. The individual Tag can be printed, stuck, or displayed just about anywhere which immediately makes the item highly interactive. Tag was developed by Microsoft Research; the technology powering Microsoft Tag is called High Capacity Color Barcodes (HCCBs). The advanced computer imaging of HCCBs employs different symbol shapes in geometric patterns and multiple colors. This allows Microsoft to reduce the size of the tags while increasing the amount of information that can be stored and improve readability on poorly-lensed mobile phones. While other forms of this technology exists and has been used in the marketplace, it appears Microsoft Tag may become the adapted model due to flexibility of size and look, data analytics and the plain old fashion ability of these guys to push the application towards universal usage by users of smartphones. The Tag application is available for a wide variety of phones including Blackberry, Java, Symbian S60, iPhone, Windows Mobile, and Android. Go to http://www.gettag.mobi for a comprehensive list. Why could a Tag be a big deal in the Middle East? According to the Telecommunication Regulatory Authority (TRA) mobile subscribers in the United Arab Emirates (UAE) has reached over 10 million this year. The population of the UAE is just under 5 million. The number, which doubled in the last four years, represents an unprecedented mobile penetration rate of over 200%. As a result, the UAE is now the highest penetration markets in the world! It is part of the everyday lifestyle of people who live and work here. Of that 10 million nearly 1 million of the phones are now smartphones & the number is growing at an incredible rate. In the Middle East, over 3 million smartphones were sold last quarter. From a United States perspective there are big numbers as well. According to Don Kellogg, Senior Manager, Research and Insights/Telecom Practice, The Nielsen Company June 4th article “IPhone vs. Android” http://bit.ly/9cml2D, United States penetration of smartphones is at 23%. Also take a look at the rest of the piece, interesting stuff if you like smartphones. People love their toys and technology. You always have your mobile with you. Keeping that in mind, that makes for a wonderful opportunity to interact with potential buyers when they see something that interests them. If in a magazine you are reading at Starbucks has an ad about a clothing store and it has a Tag, you can “snap” it can take your mobile to a video showing off the dress or give them a discount coupon which they show the store on their phone once they arrive. A side benefit to adopt mobile tagging is that it can profoundly reduce paper communications, helping in conservation efforts. Mobile tagging can also provide analytics that can offer insight on marketing strategies, helping marketers make effective and efficient decisions about their marketing spend. 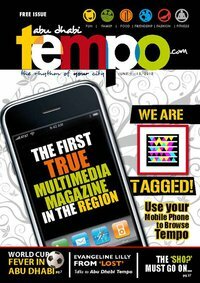 As you can see below we have launched the use of Tag in a publication we manage called “Abu Dhabi Tempo” which is free and 20,000 copies are distributed throughout the city in coffee shops, Malls, apartments, hotels, etc. We made it the cover of our June 1st edition (see below) and soon learned from Microsoft we were the first to implement Tag in the Gulf Coast Countries. In future postings I am going to report on how many “snaps” were made, what Tags were a hit and what Tags were a miss. The immediate challenge is getting the smartphone users educated on Tags, how do download the ap and then using it. These are not difficult steps per say, but getting the word out to users will need a push and will take some time. It will also take business and industry (for-profit & non-profit) to look at how they can use Tag to enhance what they do for their shareholders. If you have a smartphone & do not have a Tag yet, go on your phone to http://www.gettag.mobi find your phone type and do the download. I am heading to the United States on July 2nd for a vacation and a chance to see old friends. Besides our Lake house in Brown County Indiana, I will be in Louisville, around Statesboro, Georgia, Chicago and Kalamazoo, Michigan. Looks like Nancy and I are going to put some serious mileage on the rent-a-car before coming back to Abu Dhabi on July 27th. I will be writing my next entry around the 4 or 5th of July. Greetings from Abu Dhabi & welcome to Hoke’s Notes. A quick intro on me. Being from Kentucky I always enjoyed a good race and the excitement that surrounds it. I’ve been fortunate to attend The Kentucky Derby a number of times, The Dubai World Cup & see a day of camel racing at a track near Al Ain (see below). I also enjoy business challenges and trying something different. For over 30 years I have been a senior executive who worked throughout America from Connecticut to Alaska in the fields of broadcasting, higher education and e-learning. I learned a great deal in each place I’ve served and hopefully I made each organization a little better. Nancy and I came to the United Arab Emirates (UAE) in 2009 to have one more “great adventure” by living & working in a part of the world we never experienced. My first year, I served as Head of Marketing with a local higher education institution and in April of 2010 joined a marketing/communications firm in Abu Dhabi called BrandMoxie. During the first 18 months I have become very involved in marketing research, media, community relations, and multimedia marketing to diverse audiences. The reason for Hoke’s Notes is to share my observations & knowledge in the ever-changing field of marketing and communications in this region. The UAE has a population of 6 million of which 1 million are Emirati and the rest are from every country on earth. The language of business is English but Arabic is the native tongue plus a number of other languages are spoken. The UAE is young, has wealth due to oil, and built two major international cities in a massive desert. In less than 40 years the UAE has done remarkably well but struggles with its identity and diversifying its economy. It is a world that embraces technology and loves to show off. There are two mobile phones for every person who lives in the UAE & one million using “smart phones”. There are numerous traditional & untraditional ways to get out your message. Hopefully I will shed some light on the subject of marketing and communications in the Gulf Coast Countries (GCC).